The domain within your query sequence starts at position 2289 and ends at position 2340; the E-value for the HLH domain shown below is 8.27e-7. A number of eukaryotic proteins, which probably are sequence specific DNA- binding proteins that act as transcription factors, share a conserved domain of 40 to 50 amino acid residues. It has been proposed [(PUBMED:2493990)] that this domain is formed of two amphipathic helices joined by a variable length linker region that could form a loop. 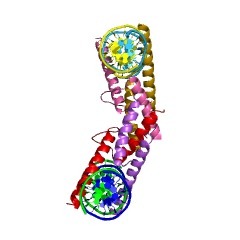 This 'helix-loop-helix' (HLH) domain mediates protein dimerization and has been found in the proteins listed below [(PUBMED:1521738)]. 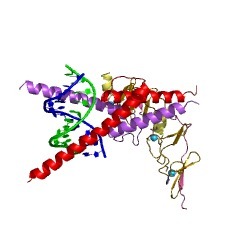 Most of these proteins have an extra basic region of about 15 amino acid residues that is adjacent to the HLH domain and specifically binds to DNA. 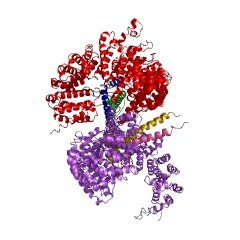 They are refered as basic helix-loop-helix proteins (bHLH), and are classified in two groups: class A (ubiquitous) and class B (tissue-specific). Members of the bHLH family bind variations on the core sequence 'CANNTG', also refered to as the E-box motif. The homo- or heterodimerization mediated by the HLH domain is independent of, but necessary for DNA binding, as two basic regions are required for DNA binding activity. The HLH proteins lacking the basic domain (Emc, Id) function as negative regulators, since they form heterodimers, but fail to bind DNA. The hairy-related proteins (hairy, E(spl), deadpan) also repress transcription although they can bind DNA. The proteins of this subfamily act together with co-repressor proteins, like groucho, through their C-terminal motif WRPW. The myc family of cellular oncogenes [(PUBMED:2175254)], which is currently known to contain four members: c-myc, N-myc, L-myc, and B-myc. The myc genes are thought to play a role in cellular differentiation and proliferation. Proteins involved in myogenesis (the induction of muscle cells). In mammals MyoD1 (Myf-3), myogenin (Myf-4), Myf-5, and Myf-6 (Mrf4 or herculin), in birds CMD1 (QMF-1), in Xenopus MyoD and MF25, in Caenorhabditis elegans CeMyoD, and in Drosophila nautilus (nau). 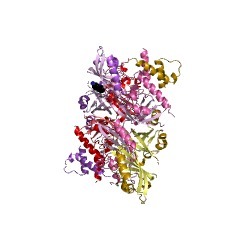 Vertebrate proteins that bind specific DNA sequences ('E boxes') in various immunoglobulin chains enhancers: E2A or ITF-1 (E12/pan-2 and E47/pan-1), ITF-2 (tcf4), TFE3, and TFEB. Vertebrate neurogenic differentiation factor 1 that acts as differentiation factor during neurogenesis. 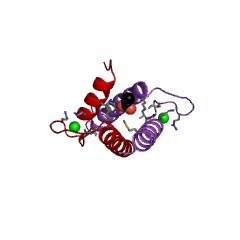 Vertebrate MAX protein, a transcription regulator that forms a sequence- specific DNA-binding protein complex with myc or mad. 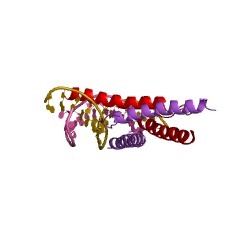 Vertebrate Max Interacting Protein 1 (MXI1 protein) which acts as a transcriptional repressor and may antagonize myc transcriptional activity by competing for max. 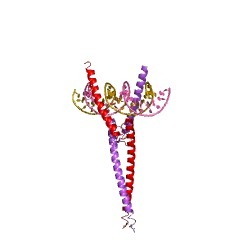 Proteins of the bHLH/PAS superfamily which are transcriptional activators. 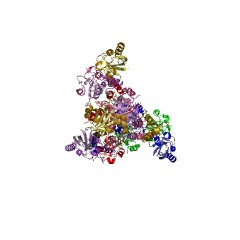 In mammals, AH receptor nuclear translocator (ARNT), single-minded homologues (SIM1 and SIM2), hypoxia-inducible factor 1 alpha (HIF1A), AH receptor (AHR), neuronal pas domain proteins (NPAS1 and NPAS2), endothelial pas domain protein 1 (EPAS1), mouse ARNT2, and human BMAL1. In Drosophila, single-minded (SIM), AH receptor nuclear translocator (ARNT), trachealess protein (TRH), and similar protein (SIMA). 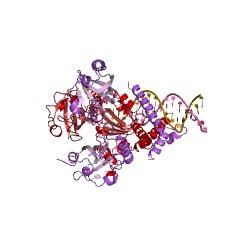 Mammalian transcription factors HES, which repress transcription by acting on two types of DNA sequences, the E box and the N box. 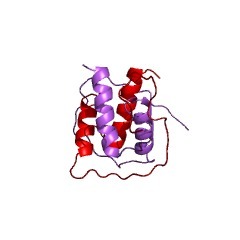 Mammalian MAD protein (max dimerizer) which acts as transcriptional repressor and may antagonize myc transcriptional activity by competing for max. Mammalian Upstream Stimulatory Factor 1 and 2 (USF1 and USF2), which bind to a symmetrical DNA sequence that is found in a variety of viral and cellular promoters. 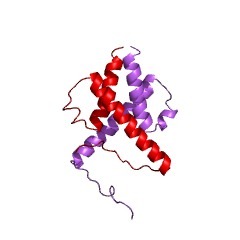 Human lyl-1 protein; which is involved, by chromosomal translocation, in T- cell leukemia. Mouse helix-loop-helix proteins MATH-1 and MATH-2 which activate E box- dependent transcription in collaboration with E47. Mammalian stem cell protein (SCL) (also known as tal1), a protein which may play an important role in hemopoietic differentiation. 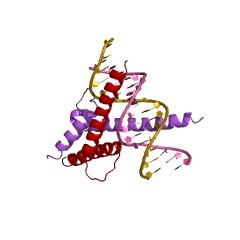 SCL is involved, by chromosomal translocation, in stem-cell leukemia. 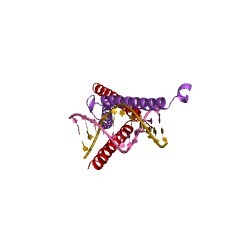 Mammalian proteins Id1 to Id4 [(PUBMED:8139914)]. 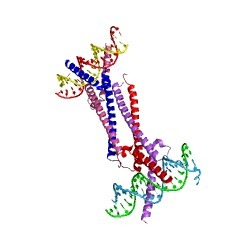 Id (inhibitor of DNA binding) proteins lack a basic DNA-binding domain but are able to form heterodimers with other HLH proteins, thereby inhibiting binding to DNA. Drosophila extra-macrochaetae (emc) protein, which participates in sensory organ patterning by antagonizing the neurogenic activity of the achaete- scute complex. 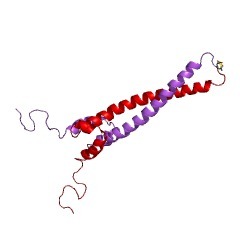 Emc is the homologue of mammalian Id proteins. 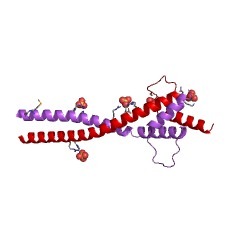 Human Sterol Regulatory Element Binding Protein 1 (SREBP-1), a transcriptional activator that binds to the sterol regulatory element 1 (SRE-1) found in the flanking region of the LDLR gene and in other genes. Drosophila achaete-scute (AS-C) complex proteins T3 (l'sc), T4 (scute), T5 (achaete) and T8 (asense). 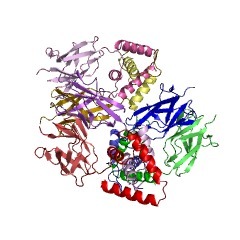 The AS-C proteins are involved in the determination of the neuronal precursors in the peripheral nervous system and the central nervous system. Mammalian homologues of achaete-scute proteins, the MASH-1 and MASH-2 proteins. 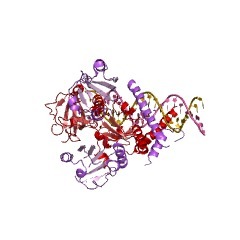 Drosophila atonal protein (ato) which is involved in neurogenesis. 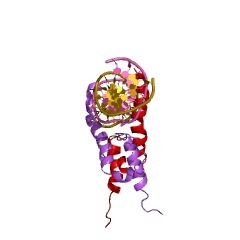 There are 86170 HLH domains in 85970 proteins in SMART's nrdb database. Taxonomic distribution of proteins containing HLH domain. This tree includes only several representative species. The complete taxonomic breakdown of all proteins with HLH domain is also avaliable. Click on the protein counts, or double click on taxonomic names to display all proteins containing HLH domain in the selected taxonomic class. 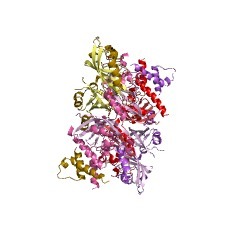 Crystal structure of the DNA binding domain of the heat shock transcription factor. The structure of the DNA binding domain, determined at 1.8 angstrom resolution, contains a three-helix bundle that is capped by a four-stranded antiparallel beta sheet. This structure is a variant of the helix-turn-helix motif, typified by catabolite activator protein. 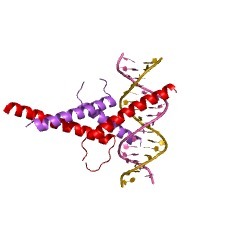 In the heat shock transcription factor, the first helix of the motif (alpha 2) has an alpha-helical bulge and a proline-induced kink. 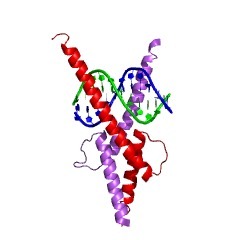 The angle between the two helices of the motif (alpha 2 and alpha 3) is about 20 degrees smaller than the average for canonical helix-turn-helix proteins. 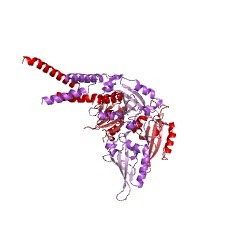 Nevertheless, the relative positions of the first and third helices of the bundle (alpha 1 and alpha 3) are conserved. It is proposed here that the first helix of the three-helix bundle be considered a component of the helix-turn-helix motif. 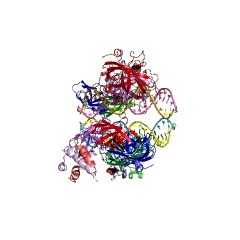 The crystal structure of a MyoD basic-helix-loop-helix (bHLH) domain-DNA complex has been solved and refined at 2.8 A resolution. 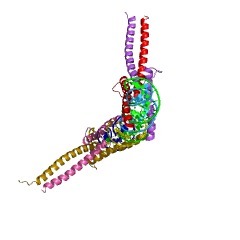 This structure proves that bHLH and bHLH-leucine zipper (bHLH-ZIP) proteins are remarkably similar; it helps us understand subtle differences in binding preferences for these proteins; and it has surprising implications for our understanding of transcription. 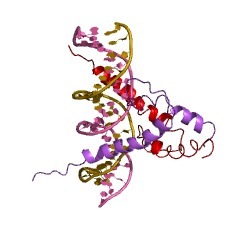 Specifically, Ala-114 and Thr-115, which are required for positive control in the myogenic proteins, are buried at the protein-DNA interface. These residues are not available for direct protein-protein contacts, but they may determine the conformation of Arg-111. 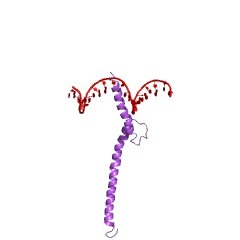 Comparisons with Max suggest that the conformation of this arginine, which is different in the two structures, may play an important role in myogenic transcription. 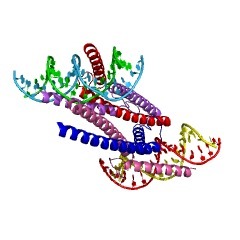 Molecular characterization of helix-loop-helix peptides. 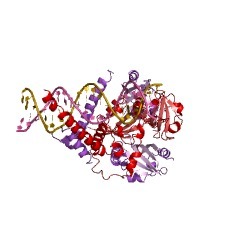 A class of regulators of eukaryotic gene expression contains a conserved amino acid sequence responsible for protein oligomerization and binding to DNA. This structure consists of an arginine- and lysine-rich basic region followed by a helix-loop-helix motif, which together mediate specific binding to DNA. 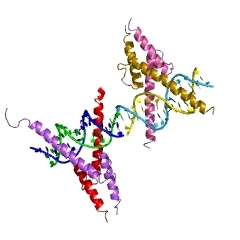 Peptides were prepared that span this motif in the MyoD protein; in solution, they formed alpha-helical dimers and tetramers. 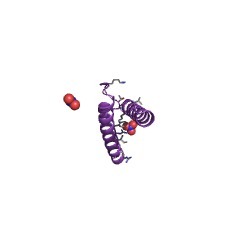 They bound to DNA as dimers and their alpha-helical content increased on binding. Parallel and antiparallel four-helix models of the DNA-bound dimer were constructed. 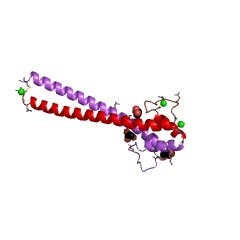 Peptides containing disulfide bonds were engineered to test the correctness of the two models. A disulfide that is compatible with the parallel model promotes specific interaction with DNA, whereas a disulfide compatible with the antiparallel model abolishes specific binding. Electron paramagnetic resonance (EPR) measurements of nitroxide-labeled peptides provided intersubunit distance measurements that also supported the parallel model. SwissProt sequences and OMIM curated human diseases associated with missense mutations within the HLH domain. This information is based on mapping of SMART genomic protein database to KEGG orthologous groups. Percentage points are related to the number of proteins with HLH domain which could be assigned to a KEGG orthologous group, and not all proteins containing HLH domain. Please note that proteins can be included in multiple pathways, ie. the numbers above will not always add up to 100%.